Over the years, Petswelcome has received a lot of calls and emails from members of the military who travel with pets. That’s because our service men and women are often on the go. Whether it’s a PCS (Permanent Change of Station) or a visit to relatives, or simply a family vacation, they put in a lot more time on the road than the average civilian. 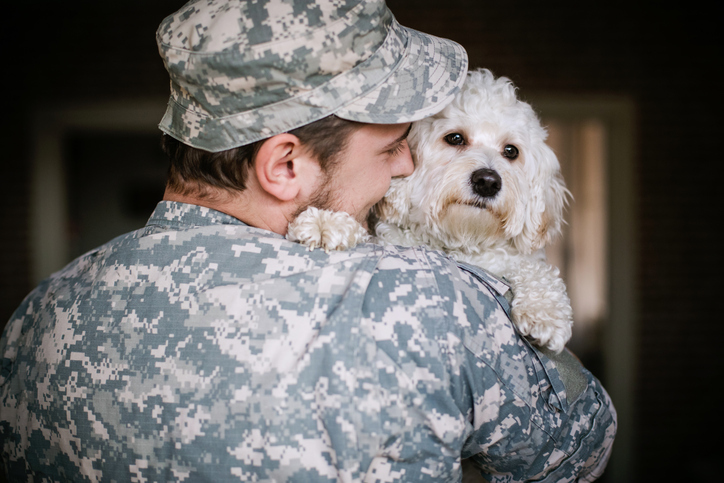 And because our appreciation of their service to our country cannot be overstated, we enjoy finding hotel discounts for military travelers with pets and making their trips as enjoyable and hassle-free as possible. People in the military have a lot of options when it comes to places stay. Some of these are for military/government personnel only, like Armed Forces Recreation Centers, a chain of affordable resort hotels around the world owned by the U.S. Department of Defense that provides much needed R&R for military personnel and their families. There are also military campgrounds and RV Parks for service men and women who enjoy the outdoors. These are more affordable than traditional camping facilities but still offer the same amenities. Best Western offers a discount of 10% or more to members of the military, including veterans and American Legion members. All you have to do is present an official ID card or work orders when you check in. If you don’t have an official ID card, contact Best Western’s Government Representative and apply for a Best Western issued government traveler card. With more than 2,700 participating properties, Choice offers guaranteed discounts for one and two person rates. Active duty and retired military personnel and their dependents, as well as federal employees and government reimbursement contractors, are all eligible for the discount. Choice also offers a new Choice Privileges Armed Services program that allows military members (active and retired), National Guard and U.S. Coast Guard to join the Choice Privileges rewards program at the Elite Gold level. Members receive 10% point bonuses on all stays as well as exclusive customer service and reservation phone numbers and other in-hotel benefits. IHG, whose brands include Staybridge Suites, Holiday Inn, Holiday Inn Express and many more, offers government per diem rates to military travelers. Each of the more than 3,000 participating hotels also also might offer other specials for service men and women, including free continental or full breakfasts. Intercontinental also includes IHG Army Hotels, which are located on Army bases and installations throughout the United States. La Quinta has a Rewards program that offers many benefits to active duty service members, veterans or military spouses. The La Quinta Returns Military Rewards program offers a 12% discount beyond their Best Available Rates price, Instant Gold Status (which gives you 20% more points for every stay), and 2 free room upgrades per year. There is also express check-in and a members only reservation and assistance line. You also will get an additional 2,000 Bonus Points after your first stay. Finally, once you achieve 6,000 points, you can start getting free nights and gift cards. At Motel 6, all active and retired military personnel, including their families, get a 10% discount. The discounted rate only applies in the country that you are serving or served in. This discount is not not be combined with other special discounts or rates. All 1,300+ locations offer the military rate; however, it may not be available during special events. Whether you are on official military travel or on vacation, Red Roof offers military service men and women a 10% discount on room rates. In addition, if you are a friend or family of someone in the military and you are visiting them on base—or if they’ve just returned from overseas or are graduating—you will also get a 10% discount. Veterans who enroll in Veterans Advantage and get a VetRewards card are entitled to a 20% discount. If you are in the military, or are retired from service, and would like help finding pet-friendly lodging, feel free to email Cindy Dahlen from Petswelcome at [email protected], or call her at 320-766-9374.